Women’s art work continues to be undervalued, overlooked and under-represented simply because the work is created by a woman. In fact, even if a female artist’s work is cast into the limelight as a “rediscovery” such as Bonheur, Gentileschi, Scipio Moorhead or Alma Thomas, it soon is forgotten once again. Are female artists “getting their turn” as the New Times proclaimed in 2016? In this exhibit we are celebrating female artists by dedicating our gallery not to women’s work, but powerful work created by women who refuse to be overlooked. Click here to view the price list for this exhibit. This exhibit is part of First Thursday Gallery Hop sponsored by the Yonkers Gallery Group, an alliance of galleries including Blue Door Art Center, Friends of Philipse Manor Hall, Urban Studio Unbound (US+U), and Yonkers Riverfront Library. Receive 10% off food and drinks at local restaurants during First Thursday Gallery Hop. Stop by any gallery for the code. Exciting Opportunity for an Artist-in-Residence! A paragraph describing why you would be a good fit for our space. A paragraph describing what work you would hope to be able to develop during your residency. Exciting News for High School Teens! Every Friday from 3:30 to 5 pm, our high school teen art club, Neo, will be meeting in the 4th floor gallery. We will be creating and discussing art, providing support for teens interested in the arts, and planning for our spring multi-media fashion, film and visual art showcase. Please join us! Not all art teachers are artists and not all artists are teachers, but there are those educators who maintain a thriving art practice outside of the classroom. We want to showcase those teachers who balance the demanding task of teaching while developing ideas and executing creative projects in an art making practice. We are primarily seeking artists from Yonkers and the surrounding areas in Westchester County and the five boroughs and from all levels of K-12 and upper academia. We seek works in any medium, including installation, but our ability to install digital media is somewhat limited. Please email with any questions. A multi-media showcase of the best of teen artists featuring live performances. The Riverfront Art Gallery is located on the 4th floor of the Riverfront Library, the main branch of the Yonkers Public Library. It opened in 2009. The Riverfront Yonkers Public Library in downtown Yonkers has long been the cultural center for the arts in Yonkers. The gallery exhibits contemporary, nationally and internationally acclaimed artwork. 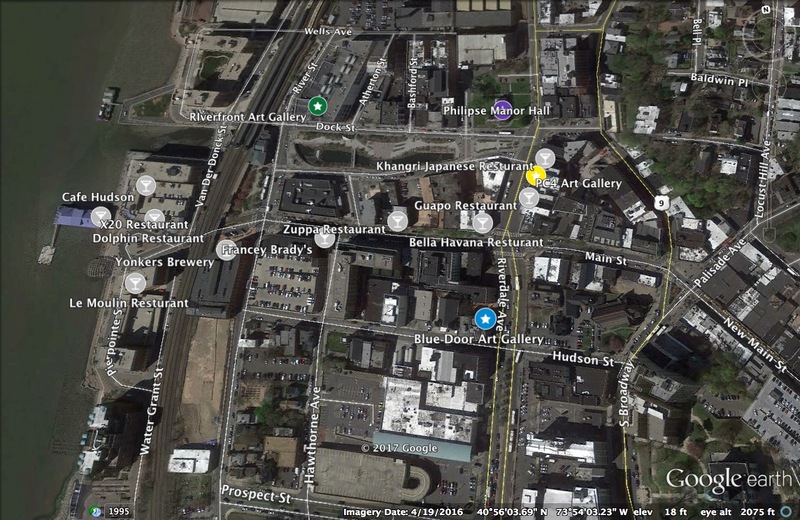 The mission of the gallery is to present a diverse and balanced schedule of exhibits of high caliber, progressive artwork and related programs not frequently seen in Yonkers and surrounding communities. The exhibit schedule is managed by a committee that is appointed by the library director. Haifa Bint-Kadi is the curator for the gallery and head of this committee. Gallery Committee, Riverfront Library, One Larkin Center, Yonkers NY 10701. • Up to three references from other galleries and/or peer artists. pertaining to past and future exhibitions.